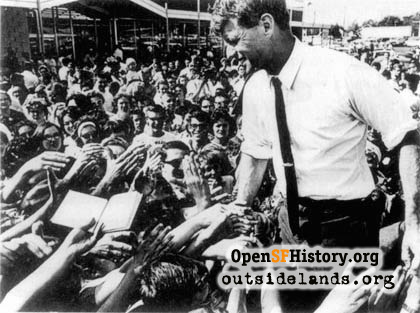 In June of 1968, when Robert Kennedy was in San Francisco, California campaigning for president, he made a well publicized stop at the G.E.T. Shopping Center (Lakeshore Plaza) on Sloat Boulevard. The event is particularly well remembered by the public because, while he was shaking hands with the crowd, an unusually perfect photo was snapped (as happened when the Marines raised a second flag on Iwo Jima), and it's showing up again in the media because of today's presidential race. My father was in the crowd that day in 1968, standing with his little girl Lynn, my much younger sister. After the speech, Robert Kennedy decided to descend the raised outdoor platform he'd been standing on. The direction he was taking, however, lacked any steps and was really too high off the ground, so a few members of the crowd offered their extended arms to him. The photo includes the extended arms of my father, a particulary strong person because of all the years he'd devoted to cabinet making and house building. Without any hesitation, Kennedy decided to choose the arms of the strong-looking man with good vibes, and my dad lifted him to a gentle landing on the ground. I heard about this later, and saw the autograph Dad managed to collect in the process, but I otherwise wasn't personally conscious of Kennedy's visit to San Francisco. The previous night (or perhaps that night, I don't recall) I was walking past San Francisco's Civic Center Auditorium when a young stranger stopped me with an offer of a free ticket into the Robert Kennedy rally. The young man explained that in order to enhance the show for the media he'd had instructions to give tickets away at a certain point. It was late in the evening, that moment had arrived, and I took him up on his offer. This was all the more tempting because in 1963 I had stood in the crowd in Eyre Square, Galway, when RFK's brother, John Kennedy, had spoken to the Irish about returning his visit by coming to the United States and "knocking on the White House door." Because I was by myself, I had no difficulty in getting remakably close to the stage, although that required taking a standing positon to the right of a huge number of young girls in Kennedy-supporter costumes and hats. As I'm a security professional, I was quite surprised that no one urged me to find a seat. We listened to a popular Hawaiian singer of that era, Do Ho, as he sang "Tiny Bubbles" and other cocktail songs. Robert Kennedy's speech eventually followed. During it, I was able to spend a lot of time looking back at the audience, including up to the balcony. As my location was obviously more panoramic than most anyone else's, I was particulary impressed at how charismatic RFK was, though I didn't personally identify with him very strongly. The social chemistry between speaker and audience was absolutely crackling with energy. It was all quite enjoyable, and when there were hints that his limo was waiting outside I decided to take up a fresh location to see his departure. 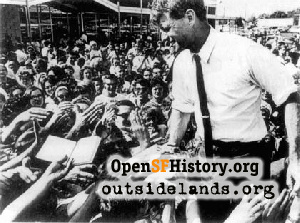 RFK then walked toward the front entry of the auditorium, but because the crowd surged around him, his departure took a very long time. When he finally did get outside, and into the waiting vehicle, I stood at the back window until they drove off. Years later, I recited all this to my father's brother, Richard, in Pasadena, California, and a peculiar look came over his face. He told me of how, sometime before the RFK assassination, he and the rest of my cousins lived across the street from Sirhan Sirhan's family. Yes, unknown to my father or me, down in LA other members of our family knew Sirhan Sirhan quite well. Uncle Richard had moved into a large house in Pasadena with his wife, daughter, her husband, and their two teenage girls. (Only my aunt lives there now.) There was a Palestinian family already living across the street, and they had a few sons---including Sirhan---who helped them to move the furniture in. When I had the opportunity, I asked my first cousin about that assocation and what it was like to be on that block when RFK was assassinated at the Ambassador Hotel. My first cousin told me that, although she was certainly shocked to hear on the news that it was Sirhan who was arrested for the assassination, she had no hesitation in crossing the street to console his mother. Cousin Mary also added (with an especially detailed observation quite charateristic of that side of our family) how peculiar it all seemed, as Sirhan's family had such a strong regard for life that they had not even bothered to disturb a bee colony that had somehow managed to establish itself in the house. As to why RFK was shot, if one subscribes to the view that Sirhan did it (and I do), the best theory I've heard so far is that it was partly about his family once having to live in a refugee camp for Palestinians, partly about him being emotionally unstable, and partly about Robert Kennedy being seen on televison by Sirhan as the senator promised to get behind an effort to send more jets to Israel. "And what of the police and FBI?" I asked Mary, "They must certainly have pestered you often with that incredibly thorough investigation that they all say they conducted." "Police? FBI?" my cousin responded. "No, none of them ever came to see us." Page launched 2 September 2008.